This premium high zoom compact camera comes with a 25x optical zoom and a large 1.0 inch-type CMOS sensor. 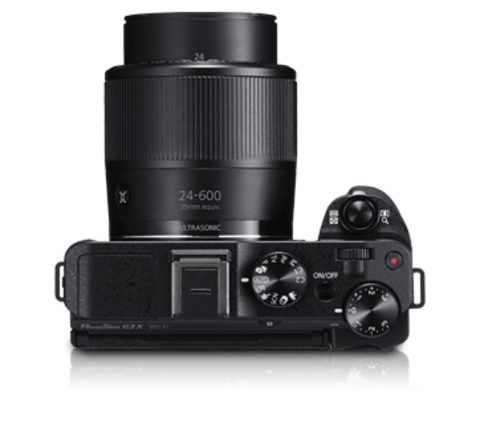 Equipped with Canon lenses with a focal distance ranging from 24mm (wide angle end) to 600mm (telephoto end), high image quality is ensured throughout the entire zoom range. Besides its improved, Zoom Framing Assist function with enhanced user-friendliness, it also supports serious, Full HD 60P movie recording. 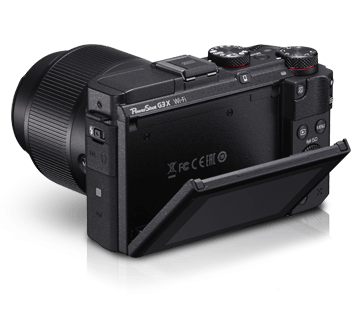 The PowerShot G3 X’s exterior joint areas are sealed by rubber material and bonding that results in dust- and drip-proof durability. This make the camera the ideal take-along in various weather conditions. 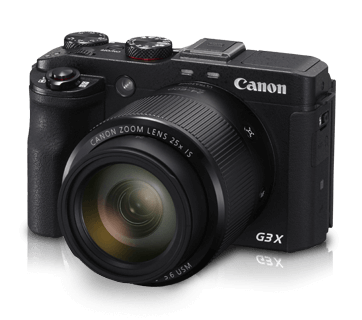 The PowerShot G3 X uses a 1.0 inch-type, 20.2MP CMOS sensor, which, at more than 4 times the size of the 1/2.3 inch type sensor on most compact cameras, allows you to shoot beautiful, low noise pictures with the large bokeh. The 25x high magnification zoom lens has a focal range of 24-600mm (35mm film equivalent) and includes 3 UD and 4 aspherical lens elements, favorably compensating for distortions and aberrations, making high resolving power throughout the entire zoom range a reality. The camera comes with Micro USM II, a high powered, precise control mechanism that is not only ideal for quick zoom framing, but also operates quietly, reducing mechanical noise and ensuring better video footage. In addition, the use of a powerful linear control mechanism allows for speedy AF function that can handle even moving subjects. The PowerShot G3 X has a simple yet masculine body design based on straight lines. The grip was developed based on the design used for EOS DSLRs, which makes it easy for users to hold with adequate support and therefore prevent camera shake while shooting at high magnifications. The presence of a front dial and controller wheel, as well as an exposure compensation dial, make it easy to operate the camera with only your right hand, just like an EOS DSLR. The 3.2-type high resolution touch panel LCD monitor can be tilted up to 180 degrees upwards and 45 degrees downwards, allowing the effortless shooting not just of selfies, but also of high angle and low angle zoomed-in scenes. The continuous ring on the lens barrel has a smooth operational feel for intuitive focus adjustment. 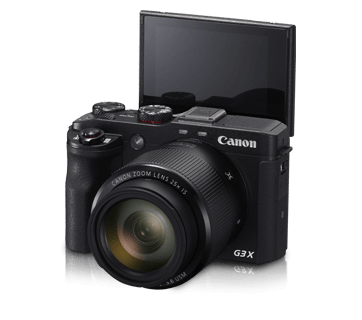 The PowerShot G3 X comes with advanced movie shooting features. With Full HD frame rate options of 24p/25p/30p/50p/60p, you can have fun with the rate that suits your expressive needs, ranging from the movie-like quality of 24p to the smooth movements of 60p. Thanks to the Manual Movie feature, the flexibility to tweak settings such as aperture, shutter speed and ISO speed to suit the circumstances—not just prior to shooting, but also during it—is also yours. The camera also comes with aspect ratio markers and can display 5 different types of aspect ratio grid lines on the display screen. On top of all that, the camera body is equipped with an external microphone jack, headphone jack, and HDMI output terminal, which allows for serious movie shooting. Shutter Speed 1 - 1/2000sec. Continuous shooting (AUTO, P Mode) Approx. 5.9 shots/sec. Movie Recoding Time (Actual Usage Time) Approx. 1hr. 5min.